The Dos Cabezas Wilderness is located at the eastern edge of the Dos Cabezas Mountains in southeastern Arizona about 20 miles east of Willcox. These days, it seems that traveling through the wilderness is the surest way to access the mountain range. Years ago, one could drive into the mountains on the Mascot Mine Road from the town of Dos Cabezas, but that road is currently locked off. Other roads in the area have been closed by the local ranchers for many years. I had noticed the listing for the Buckeye Mill Site on the Dos Cabezas topo map. Google Earth showed that there might be "stuff" on the ground so I began to study how to get there. It looked like it would be possible to hike to the mill site through the Dos Cabezas Wilderness. It would be a long hike, and it appeared that some cross-country travel would be involved. But what the heck, I had never been into the Wilderness before and I needed the exercise. I accessed the area by driving south from Bowie Arizona on the Apache Pass Road a few miles to make the turn onto Happy Camp Canyon Road. I quickly arrived at the BLM administered Indian Bread Rocks Recreation Area. It was a very scenic area of gigantic granite boulders. The area was reminiscent of Texas Canyon east of Benson. There was a small shaded picnic area in amongst the boulders. I made a note to more thoroughly check the area out the next day. This day, I had to keep moving, I was headed for the Buckeye mill. After the Picnic area, the road curves around into a notch in the wilderness. The road becomes progressively worse and soon a wilderness sign stuck in the middle of the road at a cattle tank indicates that you are to drive no further. There did not seem to be any official parking area. In fact, there is no real indication that you have arrived at the gateway to the Dos Cabezas Wilderness. 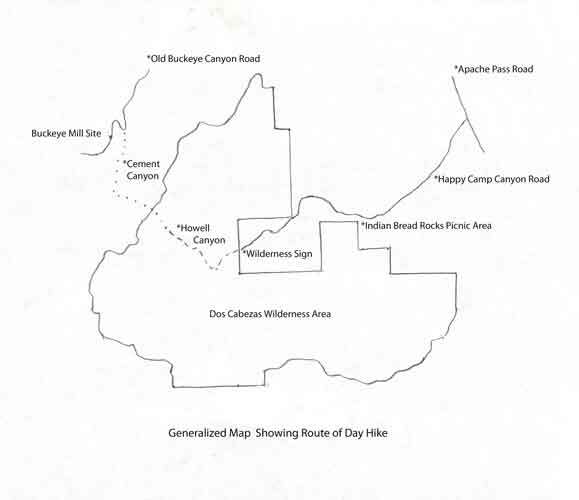 The BLM website states that there are no developed trails in the wilderness, but the map showed that the old jeep trail extended up Happy Camp Canyon past the wilderness boundary a mile or so. My plan was to follow it to Howell Canyon where I would turn north on another old jeep trail and make my way up to a divide and then drop into Cement Canyon. The reality was that the old road only remains obvious a short distance beyond the boundary. I used my map to see where I needed to go and then either traveled cross-country or made use of one of the many cattle/game trails to get where I needed to be. The bottom of Howell Canyon was very brushy. Catclaw and wait-a-minute bushes were thick. There was not much left at all of that old trail. I would say that this was real wilderness walking. Along the way in Howell Canyon, there were several instances of low rock walls arranged in lines or circles. I do not know if they were very old or not. There were a few old metallic relics scattered about. The trail ended at a mine prospect that was filled with water. It appeared that at one time the adit had been tapped for cattle water. The climb up to the divde that separates Howell Canyon from Cement Canyon was cross country and very strenuous! A fence that runs across the saddle marks the wilderness boundary on its northwestern side. I was unlucky on my descent into Cement Canyon that I did not find the good game trail that I did on the return trip! I had originally planned to go down Cement Canyon to Virginia Hill. There I was going to climb up and out to the west, pass by several old mine shafts and drop into the old mill site in Buckeye Canyon. The cross country travel had been so slow however, that I decided to travel down Cement Canyon past Virginia Hill to an old road that I had spotted on Google Earth. I would follow it north to where it intercepted the road down Buckeye Canyon from the millsite. At that intersection, I would turn south and climb back up to the millsite. It was several miles longer than what I had originally planned, but I felt that my quicker pace on the old road might make up for the difference in time in going the long way. In Cement Canyon, I passed a well developed spring(not sure if it was the Cement Spring listed on the map) and a set of foundations that had some type of beat up machinery laying around. Once on the old road, I did make good time. It had not been driven in many years. I was really surprised when I got to the Buckeye Canyon road that it also appeared to not have been driven in a very long time. Buckeye Canyon is a major drainage out of the Dos Cabezas Mountains. When I was there in May, there were still quite a few pools of water in the bottom of the canyon. If I would have known that beforehand, I might have backpacked into the area rather than doing the trip as a day hike. As I walked south, I could see the Dos Cabezas Peaks on the skyline. At the millsite, all that really remains are several large concrete foundations(I thought that they may be buildings when I saw them on Google Earth). The only machinery that I saw were an old air receiver, a part of a track off a bulldozer, and a truck cargo box set up for carrying people and materials. The mill was set up to process gold, silver and lead sulfide ores. None of the mill equipment was present. There were no tailings piles. I did not go to the mine. It supposedly was sporadically operated from the late 1800's to the 1940's with 4000 tons of ore reported to have been shipped. The hike from my truck to the mill site had been about 6 miles. It had taken much longer than I had anticipated. I really had to hustle to re-trace my steps and get back to the vehicle before dark. Fortunately, on the return trip, I located a trail in upper Cement Canyon that took me to the Wilderness boundary fence on the divide and once there I was able to locate another trail down into Howell Canyon. I was really lucky! I had time once I reached the truck to drive down to the Indian Bread Rocks area and locate a camp site near the granite boulders. That night was interesting as the critters in the rocks kept up a constant chatter! The next morning, I wondered among the rocks near the picnic ground. I saw conventional Indian grinding mortars, and several interesting rock formations, including the one in the top photo of this page. The topo map showed "ruins" located just east of the picnic area. I had to check them out. They turned out to be modern and had been constructed by someone who had access to a LOT of concrete. In wandering around to see what else might be there, I came across one of the most unusual rock boulders that I have ever seen! It was filled with grinding mortars, but they were on a vertical face! I do not believe that was how they were constructed, but I do not understand how the orientation of the boulder could have been altered. That rock was too big!